I have to concede that I am what Swedes call a “höns mamma” (hen mother). On Valentine’s Day I want everyone at home with the unifying aroma of honey rye sourdough bread emanating from the oven and floating around them throughout the house. When we enjoy it together with the crumbs scattering quickly across the kitchen table as we laugh together in this most important of rooms, this bread feels like love itself. I’m without my bread mixer at the moment, you see. So, I have kneaded this bread by hand on a pastry kneading board that has been the birth place of great breads for the past hundred years or more . I have found that kneading is not an inconvenience if you really focus on it and don’t constantly think of the next thing. It is an act of love. However, if you’ve got a bread mixer, you need not look at it longingly as you knead (excuse my pun on words) for fear of not being able to deliver the same feeling to your family and love ones. Go ahead and use it! Here is my best recipe for rye sourdough with a touch of honey to give it that lovely gentle flavor. A note about rye: it’s a good idea to try consuming more of this in your diet of grains or at least blending rye with wheat varieties of flour as this recipe does. Consuming rye flour breads has some clear benefits over eating mainly white flour breads as they include insoluble fibers which assist digestion and reduce blood fat levels. The touch of honey that I’ve put into this bread has a dual effect. It helps the bread to rise and to become airy and elastic along with the sourdough and touch of yeast. 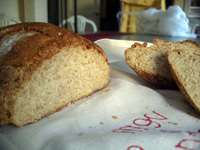 It also gives the bread a smoother, more mature flavor compared with breads made with sweet baking syrup. Make sure you choose honey that is raw – meaning it hasn’t been heated. That way you preserve its yeasting qualities for the bread. In this recipe I’m using the sourdough culture which you should make sure you’ve already got waiting for you in the refrigerator. Preparing it takes about a week of waiting (but not much work). Read about it in my entry for sourdough earlier this February. Combine flours, wheat germ and yeast in a mixing bowl or bread mixer. Add sourdough, honey and water. Knead into a smooth dough with one hand, keeping the other one free to add a bit of white flour and reduce stickiness. If using a bread mixer, blend at low speed for 2 minutes. If kneading by hand, scatter a bit of the spare flour onto a kneading board or wooden surface and knead the dough on this for about 10-15 minutes. If using a bread mixer, mix on medium speed for about 8 minutes. Add salt towards the end of the kneading process. Place the dough back into the bowl, cover with a clean, dry kitchen towel and allow to rise for 6-8 hours or overnight in the refrigerator. Preheat your oven to 250 C or 482 F. Split the dough into two, form into rounds and place on a baking sheet lined with baking paper. Cut a cross into the middle of the bread with scissors (for aesthetic purposes only – not a must). Scatter over a bit of extra stoneground wheat flour. Cover with the kitchen towel. Place near the warming oven and allow to rise for an hour or two. Reduce the oven heat to 200 C or 390 F and spray or sprinkle the dough with water just before sliding the baking tray with the bread rounds into the lower shelf of the oven. Allow to bake for 25-30 minutes until the bread is crispy and browned but not burned. Remove from the heat and allow to cool. Enjoy lukewarm with a bit of butter or margarine and a hot cup of tea, coffee or drinking chocolate. I love listening to the radio while I am kneading dough. It is a wonderful break from the hectic day! I like to partake in this unusual little relaxation technique before going to bed. That way the bread can rise while I am sleeping and be put into the oven to bake the next morning. When German settlers crossed the Great Plains into the Wild West they did it often with a small sack of fermenting sourdough tucked near their tummies. In this way they could keep their beloved sourdough just at the right temperature for the healthy and tasty cultures in the sourdough to stay alive. As a result of this cultural habit that they could not leave behind, they became known as the Sour Bellies. Since then, the world has fallen in love with sourdough breads. Particularly in the northern parts of Scandinavia and Finland, dark rye sourdough is a favorite. Why use sourdough in bread baking? Not only does the bread take on that great, tangy flavor, but you can use less yeast which frequently can give bread an unpleasant, overbearing flavor. From a health point of view, breads using sourdough cultures are better for your digestion than breads that do not use it. If you are using rye or whole grains to make the bread then there are all of the heart and digestive benefits of using those ingredients. Making and maintaining a sourdough culture is the easiest thing you can imagine if you keep a few basic principles in mind. 1) Sourdough doesn’t like drastic changes of temperature (although it should be stored in the refrigerator once prepared). Keep it at an even temperature in your kitchen. 2) “Feed” your sourdough with new flour and water once a week. If you don’t, the culture you have created in the sourdough cannot survive. 3) Keep your sourdough in a clean, sealed container. If it begins to look discolored, do not use it. Blend in a clean glass container. Cover with plastic wrap and allow to stand somewhere warm in your kitchen (e.g. above your refrigerator, near your stove) for two days. Add these ingredients to your sourdough which should already be bubbling with microbes. Cover once again and place as before. Repeat as for Day 3. Ready to use for baking. The sourdough should be something like the consistency of waffle batter. Once you have used some of the sourdough in your bread recipe, replenish the sourdough culture with flour and water as for days 3 and 4, above. Keep refrigerated. Blend and handle as for light wheat sourdough. Your rye sourdough is ready for use. It should be a slightly thicker consistency than the light wheat sourdough. Use, store and maintain as for light wheat sourdough. Now I’m off to bake some sourdough bread. 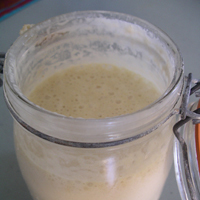 So, prepare these sourdough cultures during the coming days and return to my kitchen after that to pick up some of my very best sourdough bread recipes which I will be entering shortly. With the approach of Valentine’s Day I know that I should perhaps be throwing some oysters, clams and other libido-promoting foods into my pots. I cannot help it, though, I’m stuck on quite different ingredients when it comes to food and love. Just imagine the house at about 11.00 a.m. filled with the irresistable aroma of dark roast coffee beans. Outside it is snowing and chilly and you’ve got the fireplace going. A solo cello concerto captures perfectly the mood of this ordinary morning that you will nevertheless always remember. At your simple brunch table you’ve got a bowl of home-made seed muesli and a loaf of warm baked sourdough bread that you’ve just taken out of the oven. The family comes to join you and you sit musing and laughing over life and the passing of the day. If you are enjoying my romantic brunch thought, then you’ll most certainly want my best recipe for home-made seed muesli. 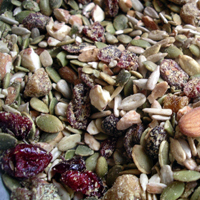 It is full of pumpkin seeds which, if you are interested, is one of those libido-promoting foods. A note: make sure that none of the seeds that you purchase are roasted or salted. Preheat the oven to 200 C or 390 F. Line a deep baking tray with baking paper. Blend the seeds, wheat germ and gingerbread seasoning. Bake 5 minutes, mix with a spoon, and bake for another 5 minutes. Remove from the oven and blend in chopped fruit and raw sugar if a sweeter flavor is desired. When cooled store in an air-tight container. Serve sprinkled on top of yogurt or buttermilk.